So as not to beat around the bush, the answer is no. In the same way it won’t save any money to tell your hotel not to clean your room, skipping the engagement session won’t change the price either. There are often disparate, but meaningful relationships from different parts of your life all brushing up against one another at your wedding. People you haven’t seen in a long time, and those you see almost every day. There are emotionally complicated moments. There are people who’s tenderness is behind a thick veil of subtlety. A good wedding photographer tries to account for all these things, tries to make predictions for the best shots, and tries to imagine what will be special for you to preserve. Now imagine someone who just met you for the first time this morning, on one of the most important and anxious days of your life, trying to decipher all those nuances on the spot. Imagine trying to be your authentic self, in some of the most quiet and private moments of your wedding day, with that person right there trying to take your picture. Most people do just fine in this situation. But people who already know and feel a sense of connection with their photographer do much better, and so does their photographer. So if the images we want to create—and you expect us to create—are made better by doing an engagement session, then that’s what try to do. An engagement session is like a very productive wedding consultation. It’s an amazing way to connect. It creates opportunities to learn about your photographer, for your photographer to learn about you, for you to form some memories together, make some inside jokes, and as a bonus, it produces beautiful images for you to enjoy. These are all things that indirectly improve your photographer’s chances at creating better images, and your experience work with them. But it also helps your photographer find the physical language that matches you and your relationship style. No two couples are exactly alike. When it comes to posing you for photos, or deliberately not posing you for photos, the right approach often takes some time to decipher. Your photographer might start working with you hands-off, giving very few instructions, and only as they learn about you do the right instructions begin to take shape. An engagement session is leisurely, full of conversations and exploration, so it’s an ideal time for this practice. By the time the wedding day comes around, your photographer isn’t spending as much time in trial and error finding what works for you. We’re not satisfied to just be run and gunners. We don’t like just dropping in out of nowhere, and back out forever when it’s over. When we create an image for a client, we want that image to matter. For a long time, our clients who chose to book an engagement session were better clients for us, and we were better photographers for them. So now, we do everything we can to give all our clients the opportunity to give us their best and to get the best from us. One of the easiest and most straightforward ways to do that was to simply spread out the cost of engagement sessions so that no-one client has to pay for it, and that’s what we did. 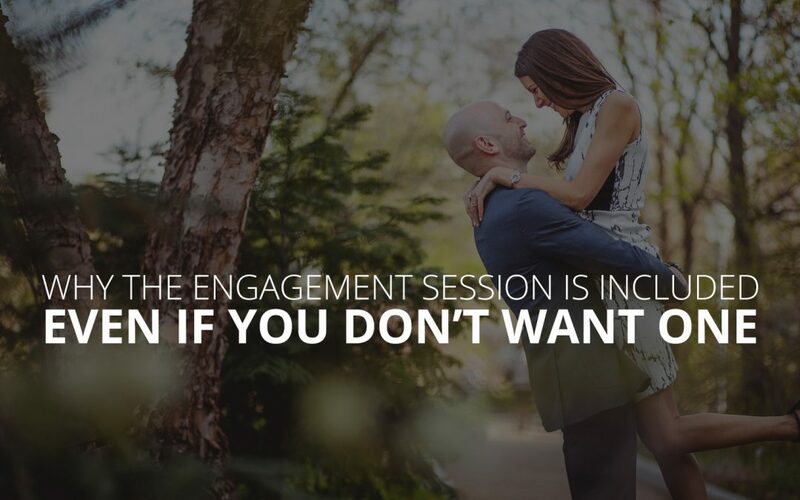 So, that is why we’re including the engagement session, even if you don’t want or need it. It’s not about the engagement images, it’s about the wedding images. The engagement images are just the bonus. You are, of course, free to skip it if you want. But since you only stand to gain from the experience, we don’t recommend you do.